If you think you might be going overboard when it comes to drinking, then you’re only one symptom away from being diagnosed with alcohol use disorder, a condition that affects nearly 14 percent of American adults. The National Institute on Alcohol Abuse and Alcoholism (NIAAA) in the United States, a division of the National Institutes of Health, said this week that nearly 33 million Americans suffer from “alcohol use disorder,” or AUD. Doctors decided in 2013 to give a label to people who problem drink – or those who consume enough alcohol to significantly distress sober living – and the results of a study published in the latest installment of JAMA Psychiatry suggests that its affecting more than just a few Americans. Researchers with the NIAA interviewed around 36,000 adults between 2012 and 2013 about their past and present drinking habits, and the results led scientists to conclude that roughly 33 million have at one time or another shown symptoms exhibited by problem drinkers. Compared to a previous study conducted during 2001, before the definition of AUD was updated, the latest statistics show a staggering increase in alcohol abuse. “These findings underscore that alcohol problems are deeply entrenched and significantly under-treated in our society,” NIAAA Director Dr. George F. Koob said in a statement. In order to be diagnosed with AUD, an adult only has to answer “yes” to two items from a list of 11 symptoms that doctors say are signs of problem drinking. Drinking more than intended, being unable to cut down on drinking and experiencing cravings are three of the factors, and admitting to any two is enough to be diagnosed with AUD. 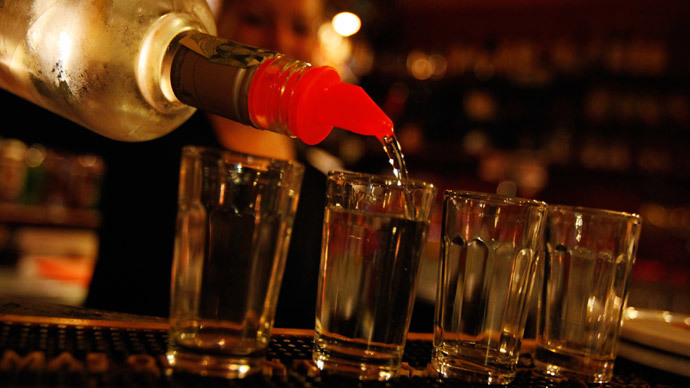 Dr. Bridget F. Grant, the lead researcher on the project, said that the results lead doctors to believe that while only 14 percent of adults have displayed symptoms of problem drinking within a year of being surveyed, nearly one-in-three have showed signs at one point or another in life. “We found that 13.9 percent of adults met DSM-5 AUD criteria for the previous year, while 29.1 percent met AUD criteria at some time in their life,” said Dr. Grant. Compared to past studies, the latest NIAA report reveals that more Americans are exhibiting alcohol use disorder now than a decade earlier. Additionally, the team’s research found that AUD rates were greater among men, and mostly in adults under the age of 29. “The new data should provide further impetus for scientists, clinicians, and policy makers to bring AUD treatment into the mainstream of medical practice,” Dr. Koob, the NIAAA director, added in a statement.